No, I really don't have "the blues." So, back to the embroidery. Lately, I've been inspired by lavender...again. Our mild weather as of late has been ideal for my lavender container plant. I also find so much inspiration on the internet! If I get stuck for an idea I just "Google" whatever it is I'm looking for and there it is. In these pieces I used the french knot, stem stitch and back stitch on linen fabric. If I don't know how to do a certain stitch I can usually find a helpful video on YouTube. I haven't decided what to do with these pieces yet. The hydrangeas are rather small, so maybe I could incorporate them into a fabric tag or I might try a decorative cuff. What do you think? I hope you are rested from the Christmas holiday rush and ready for a New Year! Beautiful! My grandmother was always embroidering something, and this post brought back fond memories of sitting in her upstairs sewing room & taking advantage of the great light that filtered into her windows. Such lovely flowers! I think the lavender is my fav. these are beautiful, becca! my favorite is the middle one. love the naturalness to them all! Just beautiful! You really make me want to take up embroidery. Have a Happy New Year! You make everything you touch gorgeous! Love all of these. 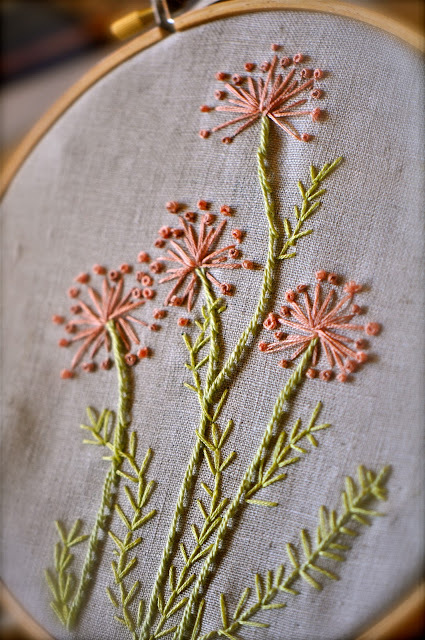 Becca, your embroidered floral pieces are beautiful! Seeing your flowers makes me want to get out the floss and get to work on a new project too. Hope you have a very HAPPY NEW YEAR!!!! Such pretty stitching. I am sure it is very relaxing while listening to music. Your french knots look wonderful. I love to do those..
What Beautiful Work you do! Whatever you Create from these amazing pieces of Stitched Art is sure to be Magnificent! There is a breathtaking beauty to not just the embroidery, but the photography...sigh. Thanks for lifting my spirits, and putting beauty in front of my eyes. Beautiful work, I too love to embroidery, but never have tried my hand at free-styling. So pretty! I love embroidering. So relaxing. Beautiful! I love this art form. You work magic with needle and thread Becca. Are they too small to put in a pretty frame and place somewhere in your home? A pillow is a great idea too! I love your embroidered flowers! I am doing crazy quilting with all the fun types of stitches but right now crocheting has consumed me...such a relaxing way to add joy to a day! Beautiful handwork. I wish I had more time for such because it seems to be a dying art. Hope you have a blessed 2012. These are gorgeous.I just love lavender! I used to enjoy embroidering myself, but haven't done it for years now, seeing yours tempts me to get my cottons out again!!! Such lovely photos. you have an AMAZING "garden"..love seeing all those artistic stitches!! Beautiful work Becca, I really love the blue flowers. You are a talented girl my friend! Wishing you a cozy New Year! OH, gaspity, gasp, gasp on those photos, Becca! I just love lavender!!!!! I love the way you've deftly piled on the french knots - really beautiful! Happy brand new fresh year to you!!! Love your embroidered pieces...because I love flowers. Oh so lovely embroidery! Beautiful work, and I was glad to read you don't "have the blues" rathering listening to them! Amazing needlework. I am not the girl for that....the fabric ends up speckled with blood from me constantly pricking my fingers. Ridiculous! Beautiful flowers. I found you because of Pinterest. The embroidery would be lovely as blocks in a quilt, too. Yep, I do a smidge of embroidery and quilting. If you don't mind, may I ask what DMC colors you used to beautifully embroider the knotted purple flowers (the last ones)? Hi your designs are very beautiful. I have a doubt, usuallu french knots look like a knot right, but here its like a small beautiful round loop, how to make the loop ? and is there a specific name for this type of french knot ?